If you want to understand a new place, start walking. Say, for instance, you’re a landscape architecture student from the University of Oregon who’s just arrived in Hong Kong. You might start at Victoria Peak—a steep hillside that is home to some of the city’s oldest neighborhoods—and take a long, wandering walk through the city, ending at the harbor in the central business district, where giant, modern high-rises loom. That’s what Associate Professor Liska Chan asked her students to do upon arriving in Hong Kong for a two-week, immersive summer program, part of an exchange between the UO’s School of Architecture and Allied Arts and the University of Hong Kong Faculty of Architecture. The program focuses on urban ecological design. 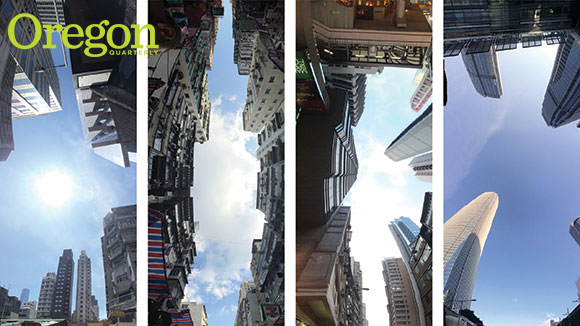 Yue Fan created a series of arresting photographs, taken at street level, that reveal a kind of urban canyon with glass and steel towers that seem to reach to the sky. 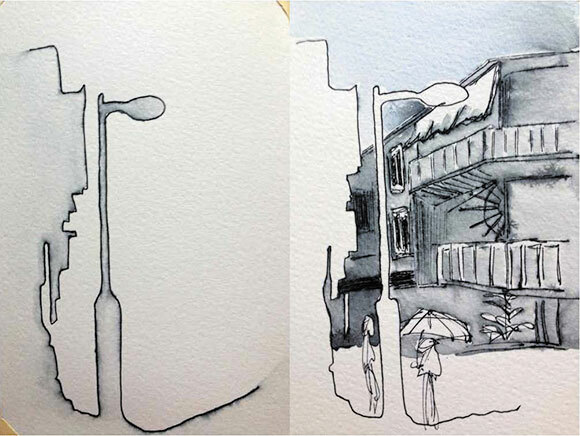 Emily Matis, who arrived in Hong Kong straight from an architecture program in Rome, blended visual elements from both cities into the images she created. Samantha Youssefi ate her way across Hong Kong, sampling traditional dishes like bird’s nest soup and shark fin soup that have become difficult to find (and which many visitors will not eat), and documented her journey in photos. The goal was for students to gain an understanding of the landscape of the city, and how its different parts relate to one another. For centuries, Hong Kong was a small fishing port under the rule of various Chinese dynasties. The island was a British colony from 1841 through the 1930s, and occupied by Japan during World War II. Following the war, Hong Kong returned to British rule, an arrangement that continued until the United Kingdom handed control to China in 1997. This history can still be glimpsed today in the city’s mix of ancient temples, Victorian-style buildings, and towering modern edifices, some of which are erected atop mountains of fill dirt dumped into the harbor. With about 7.2 million people living in an area of 426 square miles, it is one of the most densely populated places in the world, and one with a blend of Eastern and Western influences unlike anywhere else. Acquainting students with the real experience of what it is like to live in Hong Kong is a key element of the program. Associate Professor Nancy Cheng, who led the program this summer, believes that Hong Kong offers Westerners a great introduction to Asia. Students from both universities work on collaborative assignments during the two-week program. “It’s sort of ‘China-lite,’” she jokes. Indeed, with the city’s lingering British influence alongside Chinese culture, many Western visitors find it relatively easy to find their way around the city, purchase food, and interact with people even if they do not speak Chinese. For students from the UO, however, participating in the program is an opportunity to “up their game” as they mingle with top students and faculty members from the University of Hong Kong (HKU), where the program is housed. 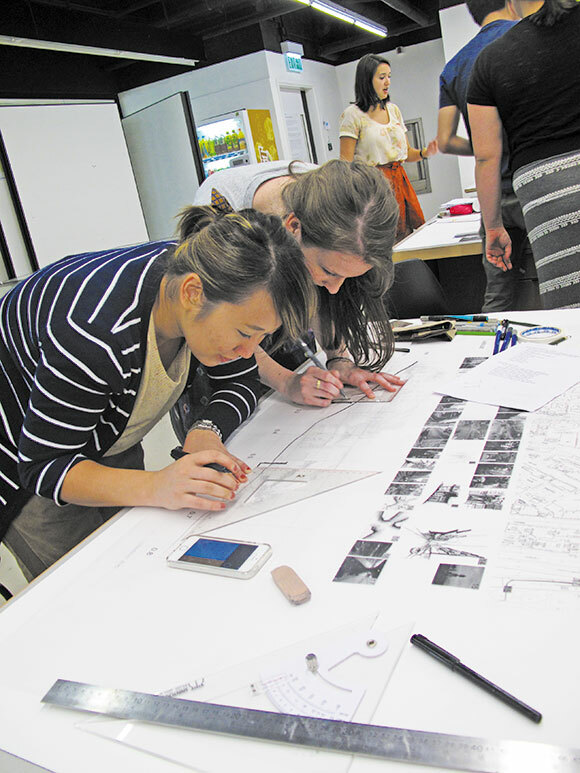 UO students interact with first-year landscape architecture graduate students at the university, which is considered one of the best in Asia. Students in the architecture school at HKU regularly win international design competitions. “The students are very good,” notes Cheng, who taught at HKU for three years before coming to Oregon. UO students, for their part, bring a sensibility to the classroom that HKU professors find beneficial. Chan reports that when she led the program, the department chair at HKU expressed his appreciation for the Oregon students’ willingness to speak up in class, sharing their opinions and engaging in discussions of hypotheticals. These are skills that Chinese students sometimes lack, having been educated in a system that emphasizes the group over the individual. The chair was pleased that the HKU students seemed to be positively influenced by their UO peers, and were more willing to speak up in class for the rest of the year. Julie Lau, BArch ’91, director of the architectural services company Traces Limited, was the project manager on the tallest building in Hong Kong. She arranges tours of the building for the group, but also treats them to wonderful meals and offers her perspectives on the city. Tony Wong, BArch ’76, is an architect and the founding director of the architectural firm WCWP International Limited. He also takes students and faculty members out for meals and shares his professional expertise. “We are so fortunate to have a group of alumni who absolutely love the UO and really want this program to happen,” notes Chan. Their support and participation are keys to its success. Cheng adds that HKU provides the UO visitors with excellent housing and meals, offering an ideal home base for the program. Oregon has hosted two HKU professors at the annual Holistic Options for Planet Earth Sustainability conference—architecture professor Juan Du in 2014 and landscape architecture professor Dorothy Tang in 2015. The department would love to repay the hospitality of their Hong Kong hosts by welcoming students from HKU to Oregon. Expanding the program into a true exchange is still a work in progress, but Chan and Cheng agree that HKU students and faculty members have considerable interest both in the state of Oregon and in the UO’s strength in sustainable design. Just as walking from mountain to harbor was critical to understanding Hong Kong, visitors from the East will benefit most from experiencing the landscape of Oregon, as well as experiencing firsthand how the School of Architecture and Allied Arts approaches its work.